You have landed on the best page for Boston Pizza menu prices. With over 365 locations, Boston Pizza is Canada’s No.1 casual dining restaurant offering patrons a unique dining experience. Each location offers two dining concepts under one roof; a family-friendly casual restaurant and a sports bar. Diners will always find something new to eat as the Boston Pizza menu has over 100 unique items to choose from such as their famous gourmet pizza & pasta, juicy burgers, appetizers, salads, entrees, and BP wings. Boston Pizza is a great location for families, groups, and teams to gather for a great meal and enjoy live sporting events on the big screen, high definition TVs. And when the weather outdoors is cooperating, you can grab a drink or meal on the outdoor patio. Below are the latest Boston Pizza menu prices. MyBp is Boston Pizza’s guest recognition program. By signing up for the program, you will receive free food items during your dine-in visits, receive personalized emails based on your preferences, and receive unique promotional offers. Another benefit of the MyBP loyalty program is with online ordering of food items.As a MyBP member, you will receive exclusive offers for online orders. Ordering will be a snap since your contact info, preferences, and past orders will all be saved to your personal account. When ordering online, you have the option to pick it up yourself or have it delivered. That’s convenience. Restaurant Meal Prices is your source for quickly finding the menu prices of your favorite Boston Pizza items. If you have more time to browse the Web, head on over to Boston Pizza’s official website. What can you learn on their website? Everyone is health conscious and watching their calorie intake. The website includes a nutritional information page that provides detailed information that you can view to make wise dining choices. Boston Pizza offers food choices for vegetarians and those looking for gluten-free items plus a selection of carefully prepared items for those diners that are looking for a balanced meal. Who doesn’t like a gift that you can eat! Boston Pizza has gift cards. From the website, you can order e-gift cards that are delivered instantly and redeemable at any Boston Pizza location. You can be old school and order a plastic gift card that can be refilled and used in-store, for takeout, or delivery. The chose is yours. Reserving your table before you get there is a smart way to avoid any drama. Check with your favorite location to see what their reservation policy is. Hosting a social event or planning a corporate meeting. Knock it out of the park with Boston Pizza catering. Again, check with your favorite location to see if they offer a catering menu. You love the food and concept of Boston Pizza that you want to be a team member. That’s great! Visit the Boston Pizza website Careers page to learn more about current opportunities, their fun and flexible working environment and their scholarships & training programs. We mean the kids. Kids need to eat also. Why not treat them to a special BP Kids meal. BP Kids meals include classic favorites and an activity pack and create-your-own sundae. 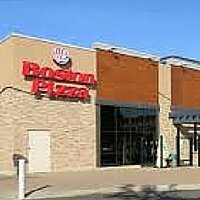 Boston Pizza also has several school programs. The school lunch and fundraising program are two great ways for schools to raise money. The Student Award program is a wonderful way to recognize and reward students that display effort and contribute positively. In 1968, Jim Treliving became the first franchisee for Boston Pizza & Spaghetti House in British Columbia. Jim’s partnership with George Melville led to a chain of 16 restaurants in B.C. In 1983, the pair purchased the chain of 44 restaurants known as Boston Pizza International. That began the expansion of Boston Pizza into what it is today. A chain of 365 locations serving over 40 million patrons annually. International expansion has started in the US & Mexico under the name ‘Boston’s The Gourmet Pizza’. To learn more about Boston Pizza hours, locations and the latest news, visit their official website. Does Boston Pizza offer vegetarian pizzas? Boston Pizza does offer several pizzas that are considered vegetarian? Are Boston Pizza fries gluten-free? The fries from Boston Pizza are not gluten-free. Boston Pizza does offer gluten-free food options.